Aboriginal Australian actor David Gulpilil made his film debut at age 15 as the native boy in Nicolas Roeg’s 1971 mood-piece adventure Walkabout. And he’s worked steadily since, in features as diverse as Peter Weir’s The Last Wave, Peter Faiman’s Crocodile Dundee, Phillip Noyce’s Rabbit-Proof Fence, John Hillcoat’s The Proposition, and Baz Luhrmann’s Australia. But while the films have been diverse, the roles are less so: His résumé includes an awful lot of “wise voice of the inscrutable native people” types, with an emphasis on trackers, truth-tellers, and other guides for white folk having a hard time finding their way, literally or figuratively. One of the strongest aspects of Rolf de Heer’s solemn feature Charlie’s Country is that it pulls Gulpilil out of that mode entirely. His role here is also of a familiar type—the native displaced by a dominant and domineering white culture—but at least he’s working from his own experience, and taking center stage in his own story. Gulpilil and his co-writer and director, Netherlands-born, Australian-raised filmmaker Rolf de Heer, have collaborated on previous projects; Gulpilil starred as the title character in de Heer’s 2002 feature The Tracker (about a native guide helping three white men look for a murderer in the Australian outback in 1922), and played opposite his son Jaime Gulpilil in de Heer’s 2006 story-within-a-story feature Ten Canoes. But Charlie’s Country is Gulpilil’s first screenwriting credit; he and de Heer developed the film together while Gulpilil was in prison for alcohol-related domestic assault, and his experiences weigh heavily on the storyline. Gulpilil stars as an Aborigine who goes by “Charlie”; it’s significant that his real name isn’t revealed, though that doesn’t become obvious until a doctor asks permission to call him Charlie, citing “trouble pronouncing foreign names.” (The irony: The doctor is clearly the foreigner in the conversation, which Charlie notes bitterly to himself, in his own tribal language. The film is predominantly in English, but has long subtitled segments where Charlie talks to friends, the kids in his community, or just clueless white people whom he knows won’t understand him. Australia submitted it for the Academy Awards’ Best Foreign Language Film category.) 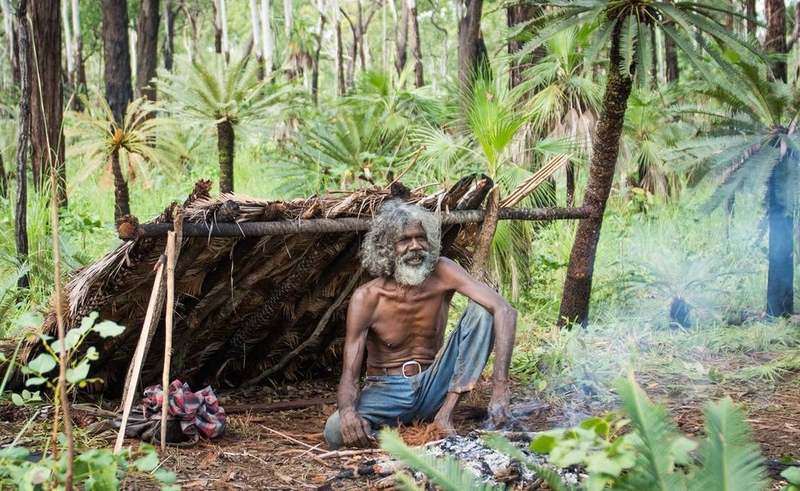 Like seemingly all the other Aborigines in his rural community, Charlie lives on a combination of a government stipend and food he forages for or hunts in the bush. “It’s like a supermarket out there,” his friend Black Pete (Peter Djigirr, who co-scripted and acted in Ten Canoes) observes. Charlie’s community doesn’t take the government money particularly seriously—when he picks up the latest installment, he promptly disburses it to anyone he passes who needs some, and a scene with a woman who comes up short at the grocery check-out suggests everyone else handles cash with a similar casualness. But his situation changes when the local police confiscate his gun because it’s unlicensed and modified. When he makes a spear to hunt with instead, they take it as well, because it’s a weapon. They also impound Black Pete’s Jeep and the water buffalo he’s just hunted down, arrest the men who’ve just sold Charlie some pot, and ban alcohol in the area. There’s a casual disinterest to all these rules and the way they’re enforced: The universally white cops don’t have any particular animus against the Aborigines, and aren’t persecuting them out of racist venom. They’re just complacent, apathetic, and oblivious about the ways their laws—and the implied puritanical moral codes behind them—affect people who live grudgingly on the edge of their civilization. There’s a deep well of anger simmering under Charlie’s Country, in the way Charlie follows all these abrogations of freedom by retreating to the bush to live “in the old ways,” and his repeated refrain that he wants his country back, that he wants to return to a home that no longer exists for him. But the film expresses that anger quietly, letting it sublimate into grief and resignation. De Heer spends long, silent moments studying details—a pair of gnarled, folded hands; a sprout emerging from a seed pod; a tiny point of reflected light in Charlie’s eyes—or simply observing Charlie in solitude, lying under a lean-to or chatting companionably with a fish he’s just caught and cooked. The soundtrack is minimal, mostly a repeated piano riff, and the editing is unobtrusive. The whole film feels not like a call to arms against Australian policies, so much as a study of life adjacent to them. Charlie’s Country is sincere at the expense of nuance, and tragic at the expense of variety: It tends to hit its points over and over, with blunt, on-the-nose sincerity. But Gulpilil’s performance keeps it from crossing too far into hand-wringing preachiness. At 61, Gulpilil is a ropy man with a weathered face and a grey-white lion’s mane of thick, wild hair. He often schools his face into a mask-like stillness, as Charlie deliberately hides what he’s feeling from pushy cops or scolding elders. But he’s often most expressive when withholding his feelings. And when Charlie and Pete trade banter, they share a particular “hey, hey!” laugh that sounds like a community call to celebration; it’s so evocative that the film gets more pain from Charlie falling away from laughter than it would from long speeches or big drama. (A draggy courtroom scene toward the end feels like a mistake: It evokes Werner Herzog’s Where The Green Ants Dream in slowing down the story and muting the story’s most compelling characters.) By simply watching Charlie competently, confidently operating on his own in the verdant, beautifully shot wild spaces outside of town, de Heer gets across everything worth saying about assimilation, and what’s lost when one culture devours another. It’s a rare starring role for Gulpilil, but an even rarer showcase where his character gets to find his own way, instead of leading others where they need to go.